In my series, a lot of madness takes place. A lot of the events in my tale are inspired by true events or loosely based on them. I thought it would be interesting to dig through our history and revisit some of the madness. The Cult Town: In my series, accidently strolling into a cult town is simply one wrong turn away. One of the most famous cult town in our history was Jonestown. Jonestown was the informal name for the Peoples Temple Agricultural Project, an intentional community in northwestern Guyana formed by the Peoples Temple led by Jim Jones. It became internationally notorious when, on November 18, 1978, 918 people died in the settlement as well as in a nearby airstrip and in Georgetown, Guyana's capital. The Cannibal: Yes, Cannibals appear throughout my series, some fighting their urge while others decide their appetite comes first. In history, a case of cannibalism takes us to the boxing ring. Holyfield-Tyson II is a name used to identify the boxing match between Mike Tyson and Evander Holyfield on June 28, 1997, in which Tyson bit Holyfield's ear. The Hunter: In my series you’re also introduced to Hunters. 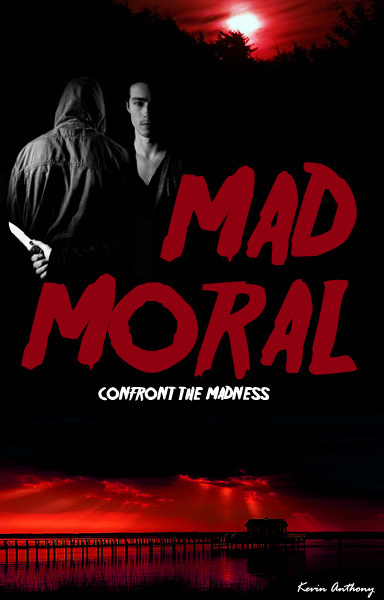 The madness influences them to stalk, kidnap and end the lives of innocent victims. It’s a practice all too familiar in our history. Adam Walsh was the 6-year-old son of John Walsh (who later became the host of America's Most Wanted) and his wife, Revé. He was abducted on 27 July 1981, from a Sears department store at the Hollywood Mall in Hollywood, Florida and was later found murdered. The Slasher: The main character of Mad Moral is saddled with the title of slasher and its one he battles with throughout all three titles of the series. One of the most famous slashing cases in our history was the controversial OJ Simpson trial. The case was a criminal trial held in Los Angeles County, California Superior Court that spanned from the primary jury being sworn in on November 2, 1994 to opening statements on January 24, 1995 to a verdict on October 3, 1995. Former American football star and actor O. J. Simpson was tried on two counts of murder following the June 1994 deaths of his ex-wife Nicole Brown Simpson and her friend Ronald Goldman. I hope these moments of madness help you realize that my novel isn’t that far from the mad reality we already find ourselves living in. A young slasher, Ford, has struggled to fight the madness lurking in the shadowed recesses of his mind. The constant torment consumes him and threatens to topple what's left of his stability. He realizes he must find a release or his torment will lead to his utter destruction. A stranger stalks the streets of Ford's world looking for those like him, slashers, as desired victims. Ford's life at risk, he seeks out the blade-friendly stalker throughout a coastal town with the morally conflicted mindset "slash or be slashed." Mad Moral is the world of Ford Fischer, where in murderous stuffed animals, gigantic creepy crawlers, and much more madness are common place. Fischer, coupled with a romantically conflicted exorcist and a dreamer who redefines night terrors, leads us through a twisted world that can be best defined as one of a kind. Chapter 4 - Comedian: Ford made his way down a narrow hallway decorated with plaques awarded to the community center, turning into the second door on the left. Inside waited familiar faces, a few socializing, few occupying themselves with their cell phones, and a pair at the snack table. Ford met eyes one the young, dark haired slasher and smiled at him. Luke nervously returned the gesture and looked away. “I wish I had his smarts to attend these meetings when I was his age,” Ford said. Lu shrugged. “She’s not here.” She stuffed a few mini-candy bars into her jeans pockets. “Nobody,” He quickly answered, hoping to create false surety. As he followed her, he realized what ‘kitty’ she was referring to. He played with it once, nearly a year ago. Since that moment, they remained distant friends. It was odd dating somebody who possibly had the urge to stab you in your sleep. He loaded her pink and silver bicycle into his back seat and they drove to Miriam’s house. The woman lived in a small trailer park that was a short drive from the downtown area. Many nights Ford skipped meetings only to receive a phone call from Miriam questioning his whereabouts. She was a kind woman even though it was rumored she slaughtered an entire sorority house back in the seventies. They arrived at the woman’s trailer, the front yard decorated with gnomes dressed as businessmen and women. The streetlights weren’t operational, the neighborhood nearly ghost town like. Ford and Lu exited the car and headed up to her front door. He raised his clenched fist to knock only for Lu to notice the trailer door was half-ajar. It creaked as she pushed it open, Ford stepping in first. The front yard theme continued inside. No matter where they looked, a gnome was visible. There were photos, miniature figures, dishware, and plush gnomes on her couch. Ford resisted greeting them, not accustomed to silent stuffed animals. Lu grabbed the door handle, sliding it sideways into the wall. Miriam’s body lay sprawled out on her bloodstained mattress, multiple stab wounds in the woman’s chest. The average person would have reacted wildly to the scene in the bedroom. Her withering face was pale, her light blue eyes opened. Ford and Lu found themselves admiring the murder scene first, mourning the loss of their group leader second. This one certainly sounds interesting!